For the large scale of rain fall across south Asia almost was flooding since one week . 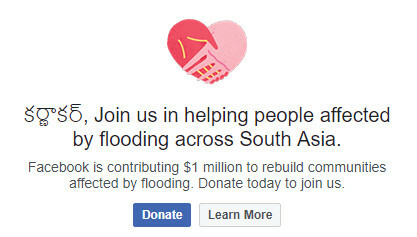 so Facebook was decide to donate something for save children. and the people that why here Facebook officially announces that there is a pop up on your Facebook home timeline. if you want to donate then click on donate button and donate something for them. the save children community was collecting donations from the Facebook users. its officially announced. the official page of save children link was given below.